WiFi calling is becoming a popular solution that allows you to make free phone calls as well as being able to increase your cell phone coverage. While there are many companies offering Smartphone apps with various features that allow free WiFi calling, there are currently just a few cell phone service providers that allow you to make calls over a wireless network without the use of an app. This article gives an overview of what this technology is and explores some of the current services offered by different companies and providers. VoIP works much like standard email. It takes communication, in this case, live speech, and breaks it down into small packets of data. These packets are sent over the Internet and essentially put back together on the other end to be heard as normal, unbroken speech. This process is called “packet switching”. If coverage is poor, packet loss can happen and interfere with the quality of the communication. Packet loss can lead to delays in transmitting voice or even dropped calls. Fortunately, technology has evolved to be more stable today than a decade or so ago and this happens less frequently. How Does WiFi Fit In? WiFi is a commonly used term that effectively refers to any type of 802.11 wireless LAN (Local Area Network), and there is no disputing the commanding leadership position that this technology now has in our society today. No longer reserved for when on the road, most people even rely on wireless networks at home as their primary connection to the Internet. This has expanded the opportunities for VoIP and allowed voice to be sent over wireless networks just as it can be sent over wired networks. Voice over WiFi (VoWiFi) is a relatively new use of the Voice over Internet Protocol, and its important to know that it is just beginning to really take off. As cable companies and cell phone carriers continue to seek new ways to be THE communication platform for customers, it is logical that we now see cell phone companies stepping into the arena to offer this functionality. To understand why cell phone carriers would want to offer an alternative to their own network, all you have to do is think of your own experiences. 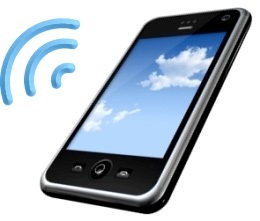 Have you ever been in a remote location and unable to get a cell signal to make a phone call? Have you ever struggled to get a consistent signal within your own home? It’s hard to imagine anyone who could say anything but “yes” to both of these situations. And the second one is perhaps the most frustrating, especially as more people give up their traditional landlines and rely solely on cell phones even at home. As carriers continue to adopt LTE technology, it potentially becomes more difficult to provide good cellular coverage inside a building. In addition, carriers outside of the big two (AT&T and Verizon Wireless) typically do not have enough low band spectrum that allows for greater overall coverage, and a stronger signal when indoors. What’s Available for WiFi Calling on a Cell Phone? There are two options for consumers wanting to make WiFi calls from their Smartphones, these being third-party apps or carrier-direct services. Let’s take a look at each one individually and how these solutions can potentially result in free WiFi calling. Skype, Facetime and Viber offer users the ability to talk over a wireless Internet connection for free. However, if the person you are talking to does not have the same app installed, you incur charges. That makes some other apps far more attractive if you are serious about wanting to have this ability. Talkatone, GrooVe IP and Phone for Google Voice and GTalk offer the most functionality at that nice free price you will love. With Talkatone, you can even drop your cell phone plan and use this solely if all you want is free talk and text. It can use WiFi alone or switch between WiFi and a cellular network if you have one. However, note that there is a limit to the number of outbound calls you can make per month without being charged. Better quality of service and freedom from ads is yours at a cost as well. This app works with any Android 4.0 or higher device, including tablets. GrooVe IP lets you make WiFi calls but the free version does not work on a 3G or 4G network. If you want that functionality, you are more than welcome to pay. T-Mobile, Sprint and Republic Wireless are currently the only carriers in the United States that offer WiFi calling without the need for an app. AT&T is expected to be releasing a solution in late 2015, while Verizon Wireless has indicated that it will be supporting this feature at some point, the company has yet to publicly commit to a date that this will happen by. The ability to make WiFi calls is limited to certain devices with the necessary functionality embedded and the latest software version installed. For iOS, this includes the iPhone 5c, 5s, 6 and 6Plus with iOS 8 software version installed at mininum. There are also some differences in what you can do with WIFI calling depending on if you are an Android or iOS user. As more carriers begin to offer this feature, consumers should carefully check what is and what is not provided for free. International calls may be allowed depending upon the carrier and the country, but there may be charges and these can vary from company to company. What about Hosted VoIP Service? Almost every VoIP provider has some form of mobile app available that works as an extension of it's solution, whether the service is for consumers oo businesses. These apps typically work the same as the aforementioned third party apps with the main difference being that they are integrated with your existing home or business phone service. That being said, they are also typically tied to the same package of monthly minutes that your service allows. So if you have an unlimited VoIP calling plan, you can use a mobile app to effectively make free calls to anyone in your coverage area (USA and Canada for example). Making these calls on a wireless network as opposed to being on a cellular network also means that these calls will not impact your monthly Smartphone data usage limit. Why bother with this at all though if you have unlimited calling minutes with your cell phone service? The answer to this is two-fold. As mentioned earlier in this article, you may need to leverage a wireless network to get any connection at all due lack of cellular coverage. The second reason is that if you use your VoIP providers mobile app, you effectively gain all the features of your phone service that you would have at home or in the office. For example if you are making business calls from a coffee shop, it is certainly nice have your caller ID be your business phone number and not your personal cell phone number. This is just one example of many useful features that make this a very powerful option for businesses, and a nice to have option for consumers. The world of communications is constantly changing and the advent of WiFi calling makes it clear that that this trend is not yet about to end. The use of VoWiFi is likely to increase in use as more carriers roll out this technology in addition to more apps being released by hosted VoIP services and third party solution providers. Is It Time To Park or Forward Your Phone Number? Can I make free phone calls if I am in USA on WIFI hot spots, I have a Samsung S5 Duo but my service is GSM from Canada with monthly service no contract and unlimited calls. -> Response: Yes providing it is using WiFi you should be fine for making calls. Of course you still need a provider and app to do this e.g. Skype etc. Also not all calls are free from these providers but they tend to have pay as you go or pre-fund options so put $10 in and it should last you a while. Is there data usage associated with voip when using a VoIP app? Also if I am traveling in my RV would I need to keep my wifi at home so I can forward call to my voip app on my cell? -> Response: If you are using an app on your cell phone for VoIP (e.g. the MagicJack app) then yes it will eat up data for sure. However it is just audio so it doesn't eat up a lot of data. Most codecs are 64kb/s so 1GB of data is about 4 hours of calls. Regarding call forwarding, for VoIP service normally you set call forwarding in your portal for the voip provider which is in the cloud. So they forward the call at their end before it reaches your house so no need to worry about Internet at home while you are in your RV.